Every year, I make it one of my goals to visit 10 new Richmond coffee shops. You should know: I'm not a coffee connoisseur by any means. I judge places more on ambience than on their actual coffee, and I've been known to get many a chai latte instead of a good old cup of joe too. 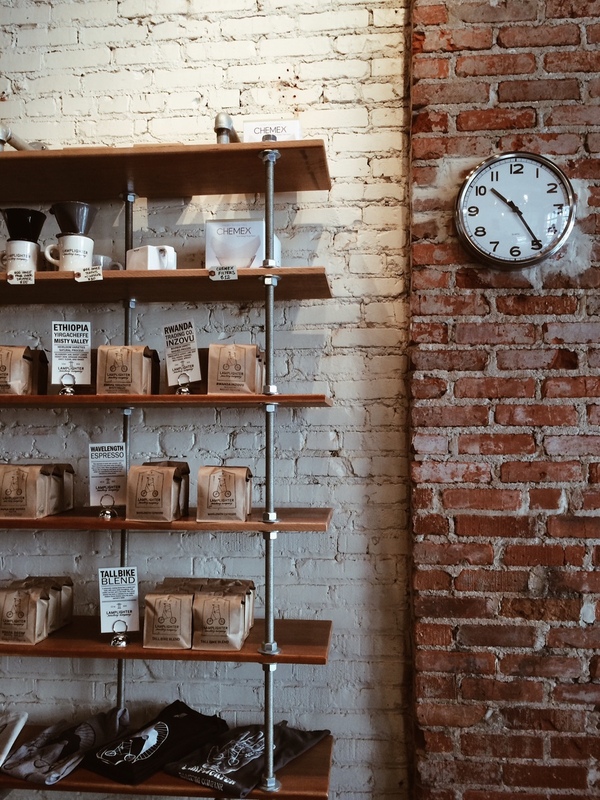 Here are a whole bunch of coffeeshops I’ve visited over the last few years since originally posting this guide-- I’m constantly updating this but be sure to double check info before planning a visit, just in case something has changed! If you live around here or ever come to the River City for a trip, let this be your guide to all things Richmond coffee! my thoughts: Black Hand was tucked away on a corner in the Fan, and it wasn't at all what I was expecting. There were only a few tables inside, and when I was there in the morning, I saw many people walk in and grab their cup of coffee to go. It seemed like that was the main mode of operation for this little spot-- neighborhood dwellers popping in to the corner coffeeshop for a quick latte and bagel before they hit the road. I snagged a table and enjoyed reading my magazine for a bit, but did feel like I should leave and not hog my spot for too long. Bonus: they had awesome art on the walls! my thoughts: I wasn't stoked on this spot, sadly. It was hard to park (parallel parking on a busy Main Street) and the barista when I went was pretty grumpy. My soy chai was pretty good, but I'm not a fan of to-go cups when I'm there to stay for a bit. There was good seating but it wasn't particularly cozy or anything. I went with a friend and we stayed for a bit and worked and caught up, but I was pretty ready to leave after about 30 minutes, which isn't really a good sign. There just wasn't anything that impressed me here. my thoughts: This has become my favorite of the Urban Farmhouse locations around RVA (there are five currently with another one coming soon). It's HUGE, spacious, bright, and casual. I can spend hours (or all day) there and not feel like I'm taking up too much space. The baristas/workers are super friendly and always give great suggestions for new drinks or food. Their menu is all seasonal and mostly local, they have vegan and gluten-free options (although overpriced, in my opinion), and there's tons of local goods to purchase all around the edges of the cafe. It's my all-time favorite spot to work and write and just hang out. my thoughts: I went to this little spot down in Church Hill on a very snowy day and had to parallel park between huge, icy piles of snow...so that wasn't ideal. But inside, this place has TONS of character and was totally unique from all other RVA coffee places! There were amazing ceilings, tons of college flags and art and photos on the walls to add funky flair, a case full of baked goods, comfy chairs by the windows with books and board games up for grabs, and a handful of tables too. 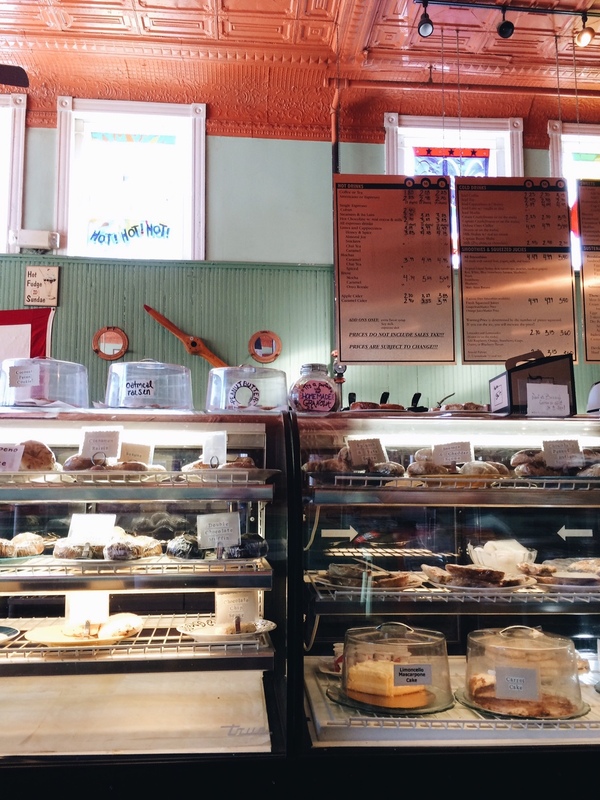 I haven't gone back purely because there are great options closer to where I live, but if I ever find myself in Church Hill, I'll be sure to stop in again! Lamplighter Roasting Company -- Suffolk Ave.
my thoughts: I usually frequent the Lamplighter location on Addison St., and I've visited the Morris St. location too, so this flagship location was the last of theirs for me. I think I rank it second out of the three. I am partial to the Summit one purely because I'm there the most, it's most familiar, it's most convenient, and they always make my chai lattes the perfect blend of spicy and sweet. This one definitely was cool, with awesome succulents and plants along the windowsill, exposed brick, and a super minimalistic vibe. There are only a couple of tables, so it isn't the best place to get work done, but in terms of excellent coffee from people who know their stuff and make it right in front of you? Best of the best. my thoughts: Boyer's is an ice cream place first and a coffee place second, and you can tell. It's a family business (which I love) and there's a super cool Christian study space in the back, but the coffee was totally average. When I used to nanny in the neighborhood, this was a place I went to more, but I'll probably never choose to go back. I would 100% eat all of their ice cream if I wasn't vegan! my thoughts: I have had two HORRIBLE experiences at this place. I don't even know why I went back after the first one, but I wanted to give them a chance to redeem themselves. I rarely actually hate a place...but I don't have good things to say about this one. Poor customer service (which is being generous), not good coffee, no working wifi, everything red (which just made it seem angry and hellish...) etc. Don't ever go here. my thoughts: I stopped here before going to my FAVE farmer's market (South of the James) one Saturday morning and it was quite the happening place! We just got straight up coffee and chose our kinds from all the carafes they had lining the shelf, which was fun but definitely not super gourmet or swanky. I would definitely go back, though, because it tons of tables and a great, quirky vibe. ps-- they often have live music in the evenings, so be sure to check out their upcoming events, as it's a great spot to chill and hear some tunes! my thoughts: This was a solo Saturday stop, and I LOVED the feel of it. It was in a random strip mall (totally not what I expected) but they had GREAT food (I got a vegan/gluten-free sandwich) and good coffee too. The weaving you see in that picture was a collaborative art installation with strips of fabric in buckets for customers to add. How cool is that?! If I'm ever over in Bon Air again (rare, but possible), I'll definitely come again! my thoughts: This fun little place is right near my new office and my team had our weekly editorial meeting there this week. 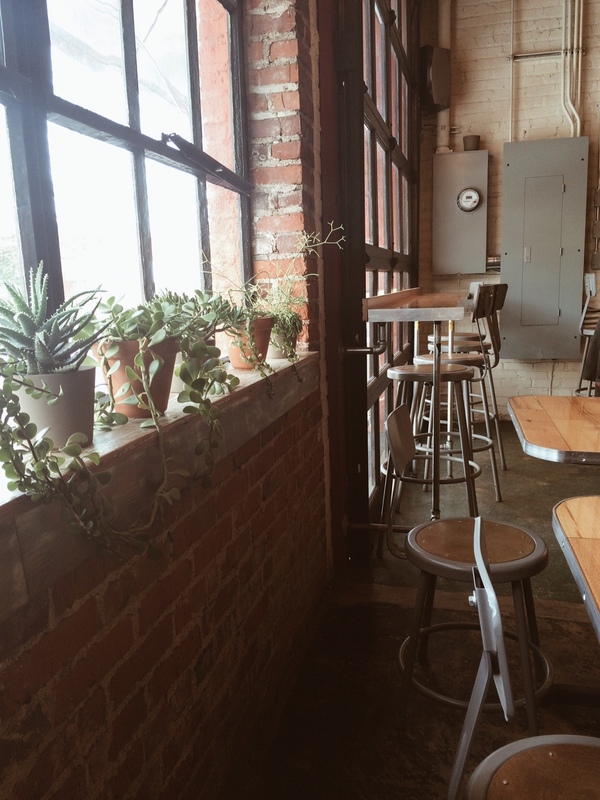 It was totally unexpected, tucked away in a corner down in Shockoe Slip, and I loved it. It's clear they're coffee pros with the wall of beans and coffee bags and the roaster in the front and everything, and my nearly-black coffee was delicious (super rare). It would be a great one to go work at, and I can totally see that happening so much more in my future. I've heard great things about the Shockoe Shake too...if only I could eat ice cream! my thoughts: This little spot in the heart of Carytown is such a gem -- amazing pastries (look at them! ), great coffee, in my FAVORITE part of town, beautiful aesthetic, a good amount of seats for not being super big... it's just lovely. Lamplighter Roasting Company -- Addison St.
my thoughts: This has long been one of my go-to coffee spots, even more so now that I'm less than a ten minute walk away! It's a tiny little corner coffeeshop, but there's an extra whole room of tables to the side of the main cafe area, and it's warm out there even in the winter! 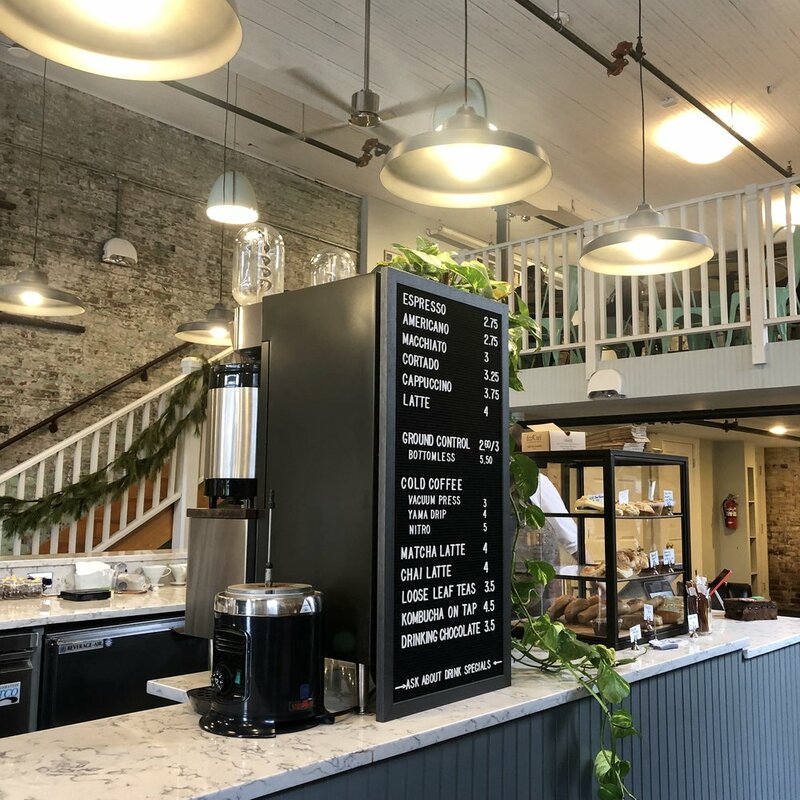 You can't go wrong with any of the Lamplighter locations -- their coffee is top notch, their menu is EXCELLENT (with many gluten free and vegan options! ), and they really know their stuff. Sometimes the music here is a little heavy in my opinion, so it's not always the most peaceful vibe. my thoughts: This is my second favorite UF location (the first being Scott's Addition, mentioned above!) -- it's down in the cobblestone area of Shockoe Slip, and the huge windows are often open to the street on nice days, so it's a really beautiful place to be. I've heard great live music here on more than a few occasions, which is a big perk for me. This location is slightly smaller than the SA one, but still has a great variety of tables and a few couches, as well as a few outdoor tables too. my thoughts: I stopped by this one after hitting up the South of the James Farmer's Market (it's just about a mile or so down the road!) but was super unimpressed. It's a HUGE open space, with a second layer over part of it, I believe, but it just felt too massive and not cozy at all. The service wasn't great and I wasn't thrilled by the menu, but I did like that nobody was near me and I could get work done and read for a while without anyone needing my table. If you're over across the river, I'd recommend Perk! over this spot any day. my thoughts: I absolutely love this little spot (it is little!) -- it's more in the Church Hill area of town, and it's beautiful! Their menu isn't huge, but they've got an impressive selection of baked goods I wished I could eat (seriously, SO MANY) and great coffee. The aesthetic here is A plus, if that matters to you, but it's definitely more of a spot to grab a quick bite than it is to linger and work. my thoughts: This used to be my favorite coffeeshop when I lived on the Northside -- it's roomy, delicious, cozy, and has a great vibe. There are great food choices on the menu (even for gluten-free folks or vegans!) and really awesome coffee. There are lots of different kinds of seating options too, which I love! my thoughts: This one is out in the West End, which isn't an area I frequent often these days, but it's a fun little stop! There's a GREAT wall of books and games, lots of tables, and several comfy couches. Be warned though-- you will smell STRONGLY of grease from their open grill/panini making, and it's not great. The coffee here is always awesome though, so maybe it's worth it? my thoughts: I didn't know what to expect from this spot -- was it a bank? a cafe? a cafe just for people who use Capital One as their bank? it definitely wasn't a cozy vibe, but it's actually pretty cool, and they handed us free coupons when we walked in which was obviously a nice bonus! they serve Peet's Coffee and made a great iced vegan matcha for me, so that won me over. it looked to have a lot of seating and would make for a great meeting spot, but felt more like your average Starbucks (with banking people and ATMs and such around...) than anything else. my thoughts: I absolutely LOVED this spot. Seriously, it takes the spot for #1 most fave RVA coffeeshop for me! I had the best dirty chai latte with oat milk that I have ever, ever had. The vibes were amazing — it’s in an old firehouse and just was super cool. 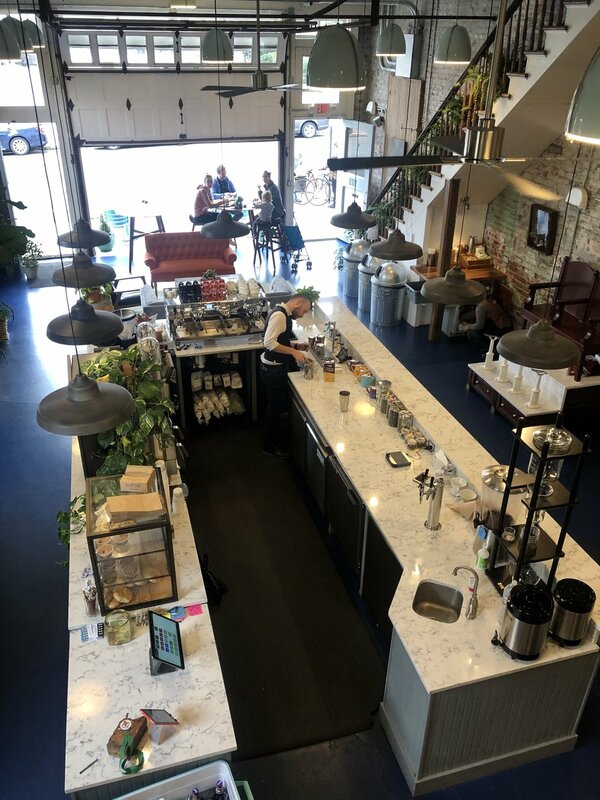 The stairs in the front were full of plants (amazing) and the upper level overlooking down to the coffee bar was great, with ample seating and tons of natural light. I couldn’t love this place more or rave about it enough! Are you in the Richmond area? Any recommendations? 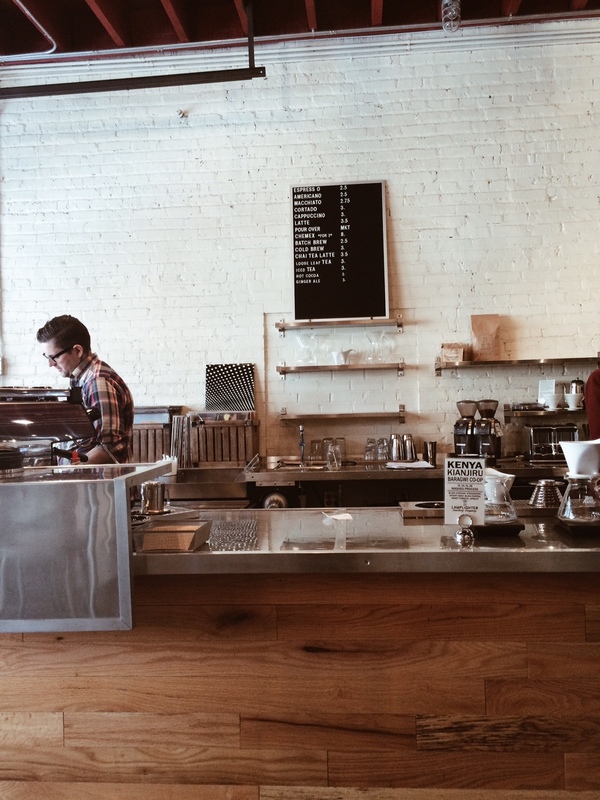 If you aren't in RVA, what's your favorite coffee shop in your area-- just in case I ever visit!